Fifteen years ago, (I can't believe I can write about 15 years ago) my family (Angie included) went to the movies to see Jurassic Park. It's the first time I remember being really engrossed in what was happening on the screen. I mean even by then I had watched Dirty Dancing dozens of times, but I didn't know what was really going on for years. In 1993, I watched kids run from dinosaurs and I won't say it changed me, but it definitely had an affect on me. Fifteen years after that, I was there, in Jurassic Park. Courtesy of Universal Studios of course. 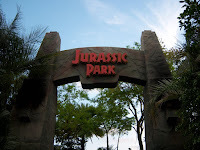 There are only four or five attractions in the Jurassic Park area. 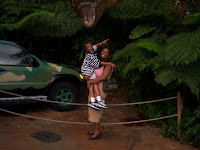 One was a Pterodactyl adventure where one needed to be accompanied by a child. There was only one child among us, so we skipped it, rather than make my dad wait for us. The highlight there was the Jurassic Park River Adventure, which was set up in an area from which dinosaurs had escaped. Other than that, it was just cool to be there. 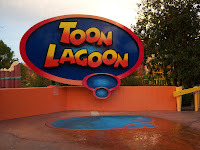 The next stop on the Islands of Adventure was Toon Lagoon. If you know me, (or if you've read my myspace profile) you know that I love cartoons. I'm watching one as I write tonight. And I'll have another on as I go to bed. Toon Lagoon didn't have any current cartoons - and while I was never a big fan of Dudley Do Right or Popeye - their rides were fun. 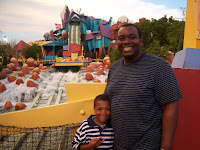 Dudley Do Right was a giant flume ride with a fantastic splash at the end. We didn't go on it because my dad didn't want to get wet. Instead, I proposed Popeye & Bluto's Bilge-Rat Barges. The description mentioned setting sail, a raft, and churning rapids. My dad said sure and Ty said no. He is also not a fan of Popeye. Too bad for him he's also 8, and therefore easily overruled. Yes. I knew we were going to get soaked. I've been on similar rides before. On top of that, there was a spot in the middle to leave anything you wanted to keep dry. The seats were all wet and the dads and sons in the raft with us had done it several times - and were soaked. But not my dad. He acted like his phone would be fine in his pocket, and that he was too cool to get wet. The first time the water hit him, he squealed. It was most unmanly. Ty and I began teasing him immediately. After that, we squished our way back to the car. 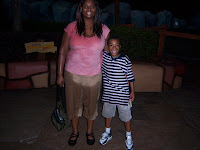 It was close to closing time and we were too wet to get on anything else anyway. It was Fantastic.